Want to drive growth to your agency? By far the best Digital Marketing firm on the market! Let us do the work while you focus on building up relationships with prospects and clients! 5 steps to client success! Alongside your core business, you now offer clients all the benefits that come with search engine optimisation. Client recognises the value in reaching a far larger audience and takes up the SEO offer. You outsource your SEO services to First Page and with our competitive pricing, you select a profit margin. We assign you a dedicated account manager for each client, complete the market analysis and implement the strategy – all while keeping you and the client updated at every point. Our cutting-edge reporting tool allows you to brand and deliver the positive results and return on investment to your client. Transparency is key: 24/7 reporting on your campaigns. We take our reporting to the next level, which is why we’ve built the industry-leading Cruncha.com. 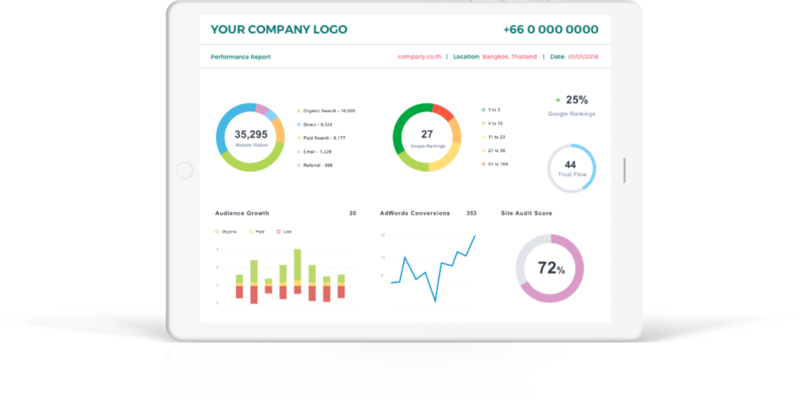 Cruncha provides your clients with a dashboard of analytical information about the performance of their campaigns while using your branding. As well as supplying your clients with 24/7 reporting that they can access anytime anywhere, we carefully tailor their analytics to monitor the goals they want to achieve. All of our data is transparent and easy to digest, allowing your clients to assess their performance seamlessly. Why not take a bit of the stress off with our white label service? Leave the technical work to us so you can concentrate on growing your brand. Our white label SEO program means you can outsource SEO, Google Ads, social media marketing, link building and more to us. Let us do the work while you focus on building up relationships with prospects and clients! As an agency owner, you know the importance of including SEO in any digital marketing strategy. SEO-related spending is predicted to grow to $808B by 2020. SEO is always going to be in demand, so offering it as a service at your agency is one of the best things you could do for business. However, SEO can be complicated. If you're not an expert, it can be extremely frustrating to not see results after all the time and money you've invested in it. Google's algorithm changes frequently. It's one of the most complex pieces of code in existence. Not to mention, SEO is getting more difficult in general - 62% of SEO specialists said that ranking in local search is getting harder. Our SEO team has a huge amount of expertise when it comes to all types of digital marketing. We have no doubt that we're the best in the business and always deliver real results to our clients. Our solutions with your branding makes you look like the expert. Get in touch to chat about our reseller plans available today!